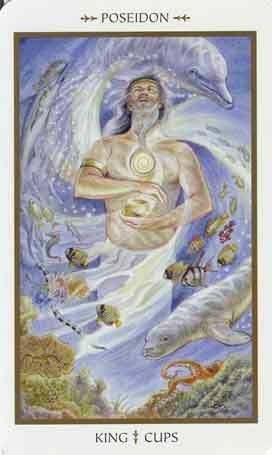 Symbols*: The god is holding a cup and meditating on oceanic life. The animals merge in a radiating swirl and enable the god to connect with a deeper, more contemplative part of his being. The seahorse is a symbol of swift movement. The seal represents the individual. The intelligent dolphin swims in the upper reaches of the psyche. It helps to direct emotional energies for a productive outcome and it connects us with spirit and the ability to see beyond the surface. The myriad fish represent the diversity of the oceanic biosphere. They are provreative, swift, and flow with the currents of our emotional responses. The octopus clings to rocks below. Past experiences, good or bad, can serve us as a means of inspiration. The internal library of experience can be a wonderful resource for creative ideas. The swirl of the god’s beard represents strength. Its illumintating light is an indication that heart and soul can direct emotional energies in a productive ways. Description*: Poseidon was the Greek god of the seas associated with fertility. He created islands, lakes, and all manner of new geographical landscapes. Poseidon’s companion animal was the dolphin. He inherited the realm of the oceans after his father relinquished power over the worlds to his sons. Zeus claimed the sky, Hades assumed the throne in the underworld, and Poseidon took possession of the seas. Like many of the Greek gods, Poseidon had a tempestuous side to his personality. If he was sanguine, he would create favorable oceanic conditions for sea travelers, but if he was of ill temper, he would churn up the waters and create inclement conditions. Sometimes his anger would manifest into earthquakes and violent storms. Poseidon was the undisputable god of the ocean, with his center of worship originating in the Aegean Sea. But he did lose a contest to Athena after her offer of the olive branch to the people was considered more useful than his offer of the salty sea water. Possible Meaning: Poseidon exercised procreative powers and the ability to connect with marine life. If you find yourself in a position of authority, remember to stay connected. Try to remember the needs of others when making decisions. It is important not to lose emotional equilibrium when deliberating choices that will have long-lasting impact. This is a time to become socially aware by avoiding the pitfalls of isolated thinking. Thoughts/Points to Ponder: This king is a good listener, patient, and mostly emotionally stable/balanced. He has learned to control his emotions, through trial and error. He lives deep down under, with the most precious of the ocean beauties, including dolphin and whale. He is fully connected with the water and nature, as well as everything that is around him. He is meditating to hear his higher-self better. Through the fast changes around him, he needs his balance through listening and being still. I admire him, he is like a father-figure to me.